In virtually every industrial sector there is the requirement at some stage for work to be carried out at height. Although we now strive to engineer out the need, with legislation in place to encourage us to do so wherever possible, the fact remains that for many years to come those responsible for safe and efficient work are going to have to manage employees at height. Well, before everyone gets too involved with systems, training and equipment let’s take one step back and consider something that all too often gets forgotten in the rush for technical solutions - the person doing the work. Do they have the practical skills to do the work needed (electrical, building, non-destructive testing etc)? Do they have appropriate training in the specific access systems intended? How experienced are they in actually working at the height and exposure expected? Are they physically capable of the work in the environment expected? All too often the first one on this list is considered straight away because it was described in the original request: ‘We need to get an electrician up there to swap that motor’. But from then on things tend to become less certain. Without proper thought, selection of personnel becomes a skills based box ticking exercise that draws the project manager away from the correct solution and places the inexperienced or unwilling in a dangerous place. BS 7985:2009 ‘Code of practice for the use of rope access methods for industrial purposes’ has a whole section dedicated to selection of operatives (section 6), which is entirely relevant to work at height in general. Aptitude and experience can be difficult things to assess. Asking someone if they are capable of doing something, especially in front of their work colleagues, does not guarantee the correct answer. Peer pressure, the desire to help or even a genuine belief that their abilities are better than they really are can find employees dramatically overstating their aptitude. "companies expecting employees to work at height should ensure that all such employees possess a full industrial medical certificate"
Section 6.2 suggests that an aptitude and experience assessment should be made before employees are selected for work at height tasks. These assessments should be up to date and readily available to those organising work. Such assessments should look carefully at previous experience, and where claims are made these are checked against up to date personal training or work records, or any previous job references held. Some previous employment types may have already involved a significant amount of work at height such as Fire and Rescue, arboriculture or the Armed Forces, and some of the skills and experiences learned might be directly transferable. Where necessary, a suitably controlled and supervised practical assessment may be required, imitating the type of equipment, techniques and environment expected at the work site. If the company does not have the ability to carry out such an assessment then it may need to consider bringing in a competent outside organisation to help it with the assessment. Section 6.1.3 of BS 7985 also reminds managers that physical fitness is of real importance and not something that can be deferred so as not to cause offence. Medical contra-indications listed include the more obvious heart disease, epilepsy and blackouts, but also include obesity, fear of heights/vertigo and giddiness, or difficulty with balance. The former contra-indications should have been picked up during a routine company medical, but the latter may not unless the examination was specifically tailored for work at height. Ideally companies expecting employees to work at height should ensure that all such employees possess a full industrial medical certificate such as those used in the offshore industry, and take regular reassessments. 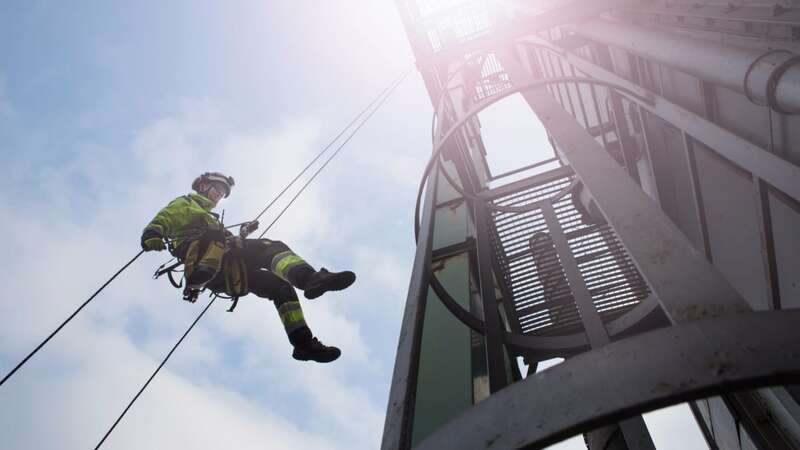 Specialist industrial trade bodies such as the Industrial Rope Access Trade Association (IRATA), insist on trainees signing a specific ‘Statement of Medical Condition’ confirming their fitness to work at height. Finally, when looking at personnel selection supervisors must ensure that employees not only have generic work at height training, such as that described in Sections 7.1 and 7.2 of BS 7985, or in the Advisory Committee on Work At Height Training (ACWAHT) Awareness Syllabus, produced in 2006 and inserted into BS 8454, covering basic knowledge for all who work at height, but also specific, detailed knowledge on the exact method and equipment being used on the intended work. Harnesses have different adjustment systems and attachment points, fall arrest lanyards have differing deployment lengths, inertia reel blocks work better in some orientations than others. Assumptions must never be made that one type will be much the same as the other. If specific training is not already available in house then manufacturers or suppliers will need to be consulted and external providers brought in before any of the equipment is put into service. Once workers have been selected and suitably trained, an employer’s concern for safety is far from over, since the selection of appropriate equipment for the job, its maintenance and eventual replacement remain key priorities. Correct selection of equipment and techniques for work at height is a massive topic that is too extensive to cover in this article, or in a single magazine issue. For larger companies whole departments are created to manage the myriad of different access systems and specialist gear needed on a multi discipline site. But what about those smaller businesses where work at height is not a daily feature, but one that still needs solutions? For these smaller concerns one possible avenue of advice and support is often mistrusted or overlooked entirely - their equipment suppliers. The second part of this article aims to get you looking at your relationship with your supplier and help decide whether their comments are all just ‘marketing patter’ or helpful advice that could improve safety, speed up the job and save you money. All too often when things go wrong, the cry goes up that the product sold was ‘not up to the job’ or turned out to be ‘no good for this site’. But did you really know what you were asking for and what it was truly designed to do? Don’t fall at the first hurdle by not understanding the language your suppliers speak. Every industry has its ‘own’ names for tools and equipment, but these may describe different things to different people. BS 7985 and BS 8437 ‘code of practice for selection, use and maintenance of personal fall protection systems and equipment for use in the workplace’ both have excellent lists of definitions which cover many of the components in common use. Assuming now, that you and your supplier are singing from the same song sheet, and you are getting what you actually asked for, in most cases the main damage done is financial, with the user having to purchase a more suitable replacement. However, when PPE is incorrectly purchased for safety critical applications the results can be truly disastrous. Work at height is one of the most visible applications of specialist PPE and it is a common activity in the majority of mainstream industries, yet time and time again we see examples of inappropriate systems, poor equipment selection and misuse. So why does it happen so often and would a little more discussion with suppliers really help? Lack of knowledge is one of the most commonly cited reasons for things going wrong. Any decision made without all the facts, without doing any research and without taking good quality advice is going to be little more than a guess. When selecting PPE and systems for work at height, a guess is not good enough. Aside from the manufacturer themselves who will know most about the applications and performance of a specialist piece of work at height PPE? Who will have access to the manufacturer’s product instructions, technical bulletins, and maintenance and inspection schedules? Who has a legal duty to ensure that the PPE sold meets not only all the legislative requirements of the country it is being supplied in, but also that as part of the supply chain they do not knowingly supply a product that is unsafe for the task described? Work at height PPE suppliers have a vested interest in knowing their customer’s industries, understanding the problems they face and providing solutions that work. They want to work with you, ensure you are happy with the solutions they offer and they want you to come back in the future. A well established supplier will, over the years, have been approached with a vast array of enquiries covering all aspects of worker protection. They will have gained an insight into many forms of work, and from their remote position accumulated and distilled the best practices used by their previous customers. What may be a new problem to you, they may well have come across many times before. So having said how good they can be, how do you assess if your own suppliers are there to help or just take your money? The selection of a new supplier should involve as rigorous an assessment as you would expect to undertake before allowing a demolition team onto your site! The effect on your business if you get it wrong can have equally ‘explosive’ repercussions. When deadlines are looming and teams are waiting to get on with the job, it is not the time to find out that your cheap source of PPE isn’t able to supply or the PPE is not what you needed. How long have they been established in this particular market? Are they a specialist dealing with a specific set of key brands, holding good levels of stock of products and spares for immediate delivery? Have they any formal business accreditations such as ISO 9001:2008 which indicate a well run and efficient structure? Are they members of any relevant industry federations such as BSIF or trade groups such as IRATA or WAHSA? Can they provide technical support or relevant documentation efficiently on request (technical information or certificates of conformity)? Can they provide or organise formal training on the products they supply if requested? Who else do they deal with? Can they provide any customer references or testimonials? Have they an efficient customer service system if you do find a problem? Have they any real life experience in using the products they are recommending? Are they trained or qualified in work at height and do they receive regular training updates on the products they sell? Do they have the ability to offer definitive advice on uses not covered by product instructions? Don’t be afraid to push for answers. Be polite - you want to build a relationship that will bring benefits to both sides - but remember you are the one with the responsibility for your employees’ welfare. You need to be sure that the people supplying their PPE are also doing the best they can for them. A quality supplier will understand your need for reassurance and be happy to show just how good they are. Time spent at this stage will pay dividends for years to come. A final benchmark I use is to see how many times a supplier will admit that they have nothing suitable in their range and advise you to look elsewhere for what you need. A professional business knows that there is no real profit in supplying something just to make a sale. If the product does not work on site then the trust built up through previous dealings will have gone in a moment. So, with all this in mind, how did you choose the last employee to work at height for you, how did you pick your equipment supplier, and how carefully will you listen to both of them in future?